In this article we will discuss all the Pros and Cons. At 60 x 60 x 34 inches it is an over-sized beanbag chair for adults, but is also suitable for kids use. Furthermore it is fully made in the USA and uses a plush microfiber cover that is machine washable and a good imitation of suede. It is stain resistant, discoloration resistant and double stitched for high durability. That shredded memory foam allows for a super comfy chair that conforms to your shape and supports you. The cover is easy maintenance and the bag takes very little setup time. Let’s look at the pro’s and con’s of buying the Chill Sack Giant Bean Bag Chair. The reviews for the Chill Sack Giant Bean Bag Chair on Amazon are hilarious. One customer referred to it as a “Godly piece of furniture”, while another admitted that his dog had monopolized it and he would have to get another. In general customers are extremely happy with the affordable price of this bean bag chair, as well as its giant size. The plush cover works wonders for creating a cloud like area of relaxation. Customers who did complain that the bag wasn’t quite full and that did raise the issue with the company were very pleased to receive a complimentary bag of filling to boost their bag and increase their experience. It is noted that when the sack first arrives you must break apart the inner filling in order for it to expand fully. One customer commented that it was great foam it just “needed some love”. Our experience of the Chill Sack Bean Bag Chair coupled with the reviews of verified purchasers alight to a good value beanbag chair that will become your favorite item of furniture. It is cool, suave, and looks good in even the most swank of dorm rooms or apartments. It is good value for a great price. 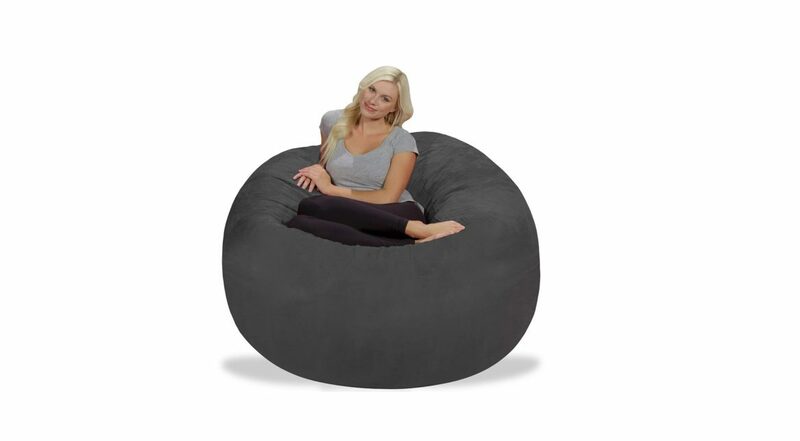 If you are looking to buy a bean bag chair this is a definite top pick. Wholly made in the USA and not imported. High grade fabrics and materials made to last. Touchably soft and comfortable to sink in to. Over-sized enough to make you feel hugged. Filling can be added to make it plumper. Affordable price and good value for money on a bean bag chair. Machine washable, stain and discoloration resistant cover. Some customers did notice that this bag has been coated with an anti-flammable coating. This is normal and occurs because of fire safety regulations. Airing the bag for a day or two will solve the issue if it happens to you. Obviously this is a safety feature to ensure that you don’t accidentally set yourself on fire while using their product. Another customer complained that the dye was not properly set in their bag, and so it ended up staining the carpet and wall. Clients also didn’t like having to wait for the bag to properly plump up after unboxing. This is caused by the bean bag chair being vacuum sealed inside a plastic wrapping. Once you cut the plastic away it takes up to 24 hours to fully inflate. This is absolutely fine and happens with many different products – but when you are desperate to start using the chair you have so longingly been waiting for it can be a little bit disappointing. We would recommend that you allow your chair to fully plump out before posting a negative online review. Finally, another customer left a bad review to say that the bag was filled with foam instead of beans… it is our estimation that this person should have read the product description before they went ahead and bought that bean bag chair. Chill Sack Customer Service has earned a complaint or two through Amazon. Not a good chair for back support. You will have to fight the kids/pets to sit on it. It might have a chemical smell when it arrives, airing will solve this. You need to break apart the foam for it to fully expand. 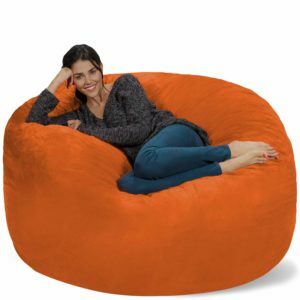 The Chill Sack Giant Beanbag Chair makes a great over-sized piece of living room or bedroom furniture. It is highly durable, has that machine washable cover and is stain resistant. It is definitely a product best suited to adults, but if you do buy it as a bean bag chair for kids make sure you give it a good airing out before you gift it to them. There isn’t anything dangerous about the smell but it will save you worrying. The sheer size and volume of this bag are what makes it a winner, but we also loved that it is fully manufactured in the USA. This means less impact on the environment and a more Eco-friendly product. Customers report that it comfortable sits two adults and is just as big as they say once fully inflated. 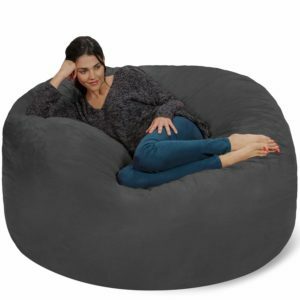 The perfect bean bag chair for a college dorm room, for a bedroom or for an extra living room chair with a semi-waterproof covering. Best of all, if you have any problems with this bag you can simply contact Chill Sack and they will throw in some extra filling for you. Overall our review of the Chill Sack Bean Bag Chair emerged in a positive light. We love the feeling of being immersed in a giant bag of memory foam…who wouldn’t?